First impression… what a beautiful candle this was. The vessel itself was large. The color, a frosted white with a pressed-board tan wooden lid that sat on the top of the candle lightly. The wax… a smooth white soy I was tempted to run my fingers across. It looked so creamy. Next came the fragrance itself. Mmmm!!! I smelled a sweet and luscious mango. Mango!! Not Blood Orange. Interesting, right? And with that said, let’s find out! Because of how large this candle was, I decided to take a chance and light it up in my large master bedroom. If this candle can scent that huge of a room, I’ll be mighty impressed. Once the wicks were lit, it took not even 15 minutes before I started noticing the aroma and the candle hadn’t even reached a full melt pool yet. So far, I’m impressed. After a good hour… the fragrance was everywhere… my entire bedroom, open bathroom and the aroma was even spilling out into my living area. Very happy with the strength of this candle!! The aroma…. a sweet and delicious mango with citrusy orange in the background. All those other elements in the scent description never really surfaced for me and I paid attention. I kept going back to the candle over and over again to see if I noticed anything more. I didn’t, and I was okay with that. 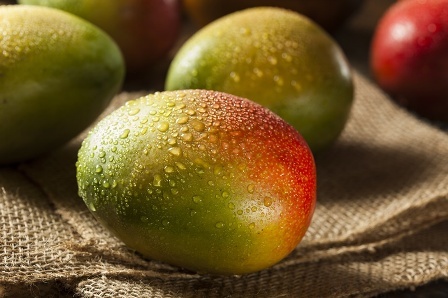 The aroma I could smell was pretty darn perfect and as far as mango scents go… sweet and delicious!! Strength – I would rate this candle an 8/9 in a really large room. 10 in medium to smaller rooms. This candle burned great! A teeny bit of wax was left on the glass walls but it wasn’t significant, I just used my wick dipper to push it all back into the melted wax so nothing was wasted. Clean burn too. I was very happy with this candles performance. What a lovely candle this was and very striking to watch burn due to its size and frosted vessel. I loved it and can’t wait to try more fragrances in this style. As far as the fragrance itself, I really enjoyed it. I know the scent name was Blood Orange, and that’s kind of what I was expecting but once you start burning the candle and the aroma begins filling your living space, you won’t mind. Especially if you love sweet mango scents. I swear that’s all I could smell… sweet and creamy mango with hints of citrus. It was fresh and really lovely. Chesapeake Bay can be found in Target stores across the country but you can also purchase many of their candles online through their website. Bonus – they’re offering Candlefind readers a discount should you care to give them a try. 35% off your entire order using code FINDER. 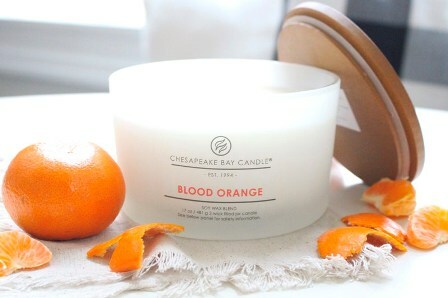 Should you not find this candle (Blood Orange) at a Target store, it’s definitely available online. More reviews to come so stay tuned.